The “Gem of the Brunswick Islands”, the barrier island of Ocean Isle stretches for seven miles along the Atlantic Ocean. Boasting sugar sand beaches, warm waters and spectacular sunsets, Ocean Isle is the perfect laid back beach destination. A unique beach community, Ocean Isle has quaint boutique stores and many waterfront restaurants overlooking the waterways. 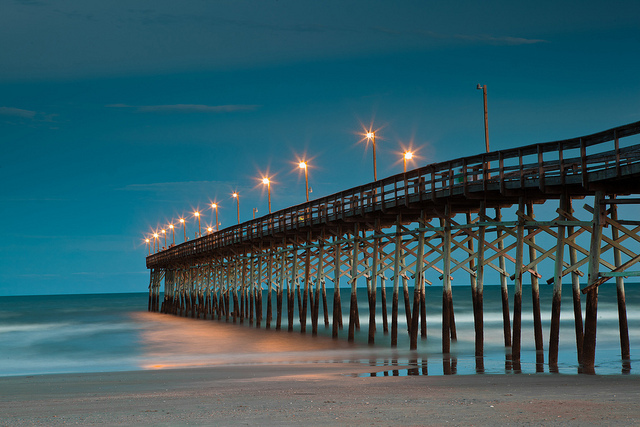 Reel in the memories on the Ocean Isle Beach Fishing Pier, one of the oldest fishing piers on North Carolinas coastline. Pleasure and relaxation are part of Ocean Isles lifestyle. Explore the ocean and waterways and share an encounter with Mother Nature in the surrounding wetlands and marshes with beautiful marine and birdlife. Hours can be spent watching the dolphins and turtle in their natural environment. 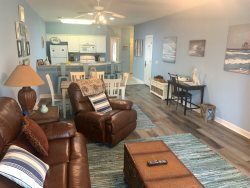 Ocean Isle is a unique family destination offering lots of activities for fun filled days. The Museum of Coastal Carolina offers great education exhibits and a fun touch tank to explore coastal life. A short drive inland is the Silver Coast Winery offering wine tasting and tours of the vineyards. Play a round of golf at one of the nearby courses along the Intracoastal Waterway while the kids have fun playing miniature golf. Take a trip back in time with a visit to the local museums and surrounding lighthouses. The North Carolina Oyster Festival takes place each October and draws visitors from far and wide with exciting entertainment and fun Oyster stew cook-offs. Swim, surf, sand, sun and so much more make this your perfect family getaway.